Also, please consider signing up for the new Realize Magazine. They gave my book a great review! 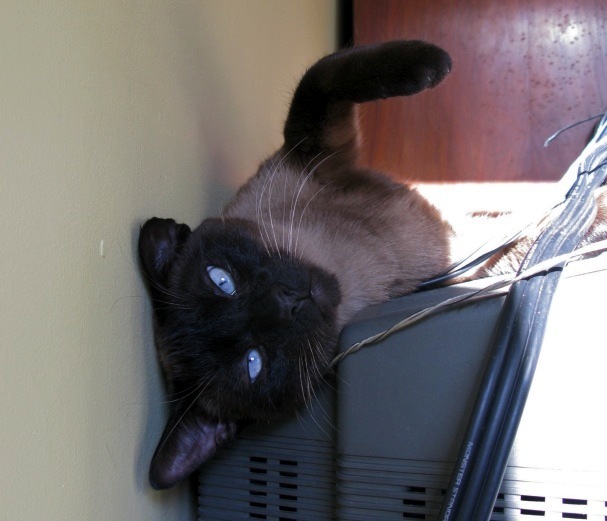 Bleeck discovers one of Finney’s favorite spots, the tv. It’s official, everyone in the house loves the tv, but for different reasons. Aw, Stacy, thanks so much for mentioning my blog. Of course, I was not thinking of you when I wrote it, but as there is still, I think, an unnecessary stigma about being single and/or childless, I hope single women will enjoy reading it. I love your book idea! And your blue-eyed cat. Hooray for grilled cheese sandwiches. Nice thick ones made with Texas Toast and Velveta. Wholesome nutty ones made with oatmeal bread and Jarlsberg. Splotchy all over the place ones made with sourdough multigrain baugettes and lost shards of whatever it was that got wrapped in plastico and forgotten in the butter bin. All of them SLOWLY grilled for at least ten minutes so the faces get really crispy and the insides melt to perfection. You don’t want to put too much cheese in lest when they are sliced the centers flood onto the plate and harden into little guitar picks. As to fries – I have become fascinated with the deliciousness of the Frozen food section Nathan’s fries that time well with grilled cheese if put in the oven before the other stuff gets prepped. The alternative is cutting, soaking, rinsing, pre-frying, cooling and crisp frying some Idahos for pomme frites . That’s a lot of prep, so sometimes it’s best to just go over to Five Guys where they do all the work, give you a huge portion in a plain brown paper bag ; and have a barrel full of free in-the-shell peanuts right by the door so you can stuff your pockets on the way out. Say the word and I will come to you immediately bearing everything necessary for a grilled cheese sandwich feast. You need not be entertaining or conversational. Just relax with your book. I will feed you, clean up and leave in a timely manner. I had a two year old TV give up the ghost due to a cat who decided that was the place to be. The TV repair guy (this was probably 20 years ago when repair guys still exisited . . .) pulled the cover off the back and found the tube covered in inches of cat hair. That pose by Bleek couldn’t be replicated at my house today with the flatscreen TV, but then I don’t have to worry about the TV’s early death. Hope you’re feeling better this weekend! I’m feeling better, thank you! My tv is hanging in there, and I’m glad. When I went to the store to look at tvs to replace it, my picture was so much better than the newer ones (which was weird). That’s funny about the cat hair, I imagine mine must be the same. Violet, it was my pleasure, I love your blog! !